The new benefit called Universal Credit has been gradually rolled out across the UK. Families with disabled children may be affected and this has caused increased financial worry and stress. To find out more if you can claim or are already affected and need advice, please download the leaflet or visit the Contact website (link below) for more detailed information. Universal Credit is a new benefit for people of working age. It is paid both to people who are out of work and to those in employment. It is replacing most of the current means-tested benefits for people of working age. 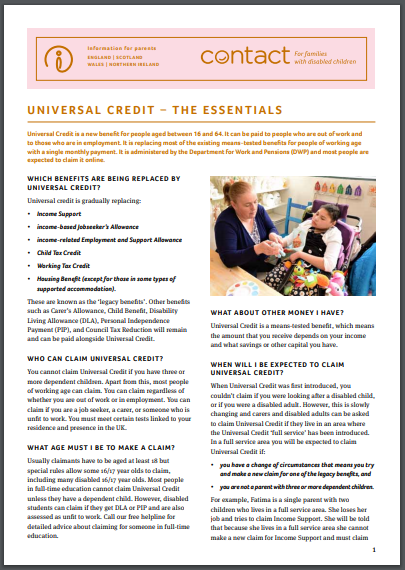 What benefits is Universal Credit replacing? These are known as the 'legacy benefits'. ​Not sure where to start and would like to talk to someone? Contact can offer advice on completing claim forms. Their national freephone helpline can also put you in touch with local help to complete any forms. Call 0808 888 3555 today to find out more. Bexley Citizens Advice and Bexley Carers Support are both able to support parents and carers of children and young people with Universal Credit information.